After spending some quality time with a preview version of Int13’s new bullet hell shooter Shogun: Rise of the Renegade [Free] last week, we were eager to get our hands on the final version to see how it all came together. And sure enough, earlier this week Shogun quietly snuck into the App Store. 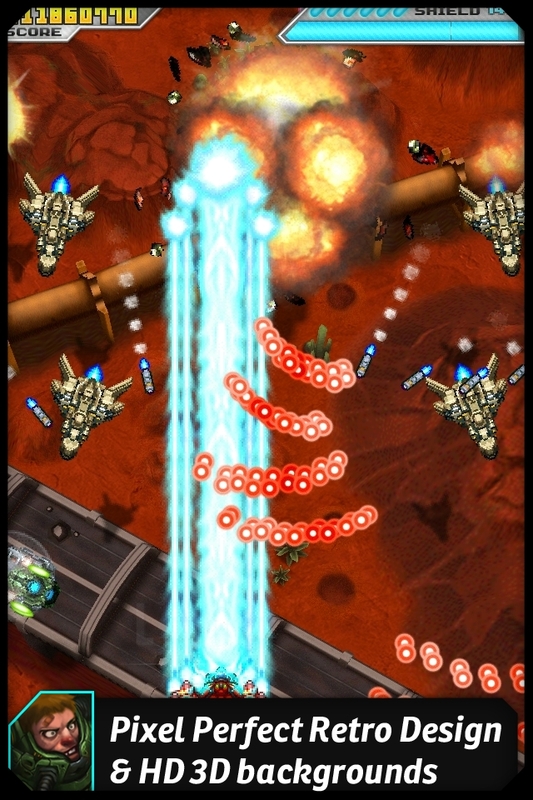 It was interesting that Int13 was departing from their typical augmented reality based games, like ARDefender [Free], and trying their hand at an established and nuanced genre like arcade-style manic shoot ‘em ups, especially with veteran shmup developer Cave basically cornering the market with their stable of high-quality ports. However, Int13 has surprised me with just how right they got Shogun, and while it might fail to totally impress the more discerning bullet hell enthusiast, fans of shmups in general will find a lot of action and fun brimming from the game. The very first thing that pops out at you about Shogun are its graphics. The environments are done up in 3D and give off a great feeling of depth as you’re scrolling by in your ship. It’s also Retina Display ready, meaning it’s razor sharp. Enemies are your standard alien-type of spacecrafts, and there are some rather interestingly designed mid-boss and end-boss fights that will give you a run for your money in terms of challenge. On the whole, gameplay in Shogun doesn’t divert too far from your typical bullet-hell shooter formula, but it executes the components of that formula extremely well. However, Shogun does show some more innovative signs in a couple of areas. One is the method in which you change your weapons. Your ship comes with 3 weapon types: spread shot, laser, and homing. Whenever you lift your finger off the screen, the game slows down bullet-time style and a small menu pops up above your ship that lets you choose from the 3 weapon types, as well as trigger a screen-clearing EMP or choose to add small wingman ships for added firepower. It’s nice that the action slows down to allow you to concentrate on what weapon you need to pick, but you can still take damage in this mode so you’ll still need to stay alert. The other thing in Shogun that I found very interesting is the system for filling and using your shield meter. You have the ability to scrape bullets that pass you by, which basically means getting your ship extremely close to them without actually getting hit. With each consecutive bullet you scrape, you build a multiplier, and this adds to your shield meter above which can go past the 100% full mark. Every time you fill up your life meter completely, it fills one of the 6 reserve tanks above the meter. Now, these reserve tanks can be used for various things, like setting off the aforementioned EMP blast or adding one or more sets of the satellite helper ships to your own ship (which VASTLY increases your firepower, I might add). Also, when you do get hit by enemy fire, the game will automatically clear the screen of bullets and shield you for a brief moment while giving you a refilled meter, but it will cost you one of your reserves. The scraping and usage of reserve tanks aren’t totally new ideas in the shmup world, but they’re done well and add a ton of strategy to how you go about being the most effective in Shogun. It’s in your benefit to scrape as much as possible and always strive to keep your reserves well stocked for particularly challenging sections and boss battles. But, you can’t concentrate too hard on just scraping, as inevitably that will lead you to take damage if you aren’t paying enough attention to killing the enemies as well. While the graphics are gorgeous and the underlying mechanics are sound, about the only thing I don’t like about Shogun is that it’s pretty short. Featuring just 4 levels to play through, it comes to an end pretty quickly, but it’s a satisfying and challenging ride while it lasts. The pay model is also pretty accommodating, allowing you to download and play through the entire first level for free. The remaining 3 levels are accessible as well, but you can only play them for a brief minute – just long enough to get a taste. Each full level is then unlockable separately for 99¢ each, or $1.99 to unlock them all at once. As a big fan of Cave’s shooters, I find it hard to really get into most of the other shooters on the App Store. They really did set the bar that high. But Shogun is a game that instantly drew me in with its visuals, and then backed it up with a ton of solid action. It even Universal and has iCade support, to truly complete the arcade experience. As a free download, there’s really no reason not to give Shogun a try for yourself. 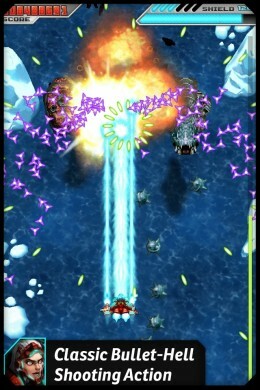 Shogun: Rise Of The Renegade is a shootâ€™em up inspired by japanese arcade games of the 90â€™s.